The lifespan of your projector lamp depends on usage and regular maintenance. Lamp manufacturers will give an estimate for your projector lamp to ensure you don’t use it past the due date. Most projectors will have a warning light on the projector itself as well as flashing a warning message on screen when the lamp is approaching end of life. Dealing with a lamp explosion can be time-consuming to clean up as well as expensive. Follow this guide and learn how to stop your projector lamp from unnecessary breakage and explosions. Counterfeit lamps from copy-cat manufacturers are prone to overheating resulting in an explosion inside your projector. Compatible knock-off lamps lamps use inferior materials. In order to get the same results as original lamps, copy-cat manufacturers will use toxic substitutes such as Krypton 85 (a carcinogenic gas) to get the same results. Counterfeit lamps are produced quickly with poor workmanship and are not properly calibrated to work with your projector. When the lamp is installed it can overheat quickly and results in lamp explosion. 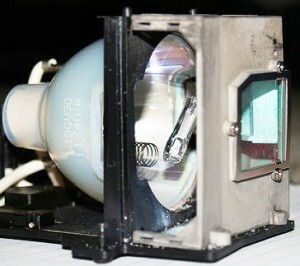 Projector lamps don’t have a filament like regular light bulbs. Light in projector lamps is created the ballast (two electrodes) igniting the gases in the arc. Overtime as the lamp get older, the ballast will be unable to light the gases in the arc but will keep heating it. The unlit arc tube will get so hot that is shatters inside the projector. Replace the lamp immediately when the Lamp Replace Indicator on the projector lights up or a “Replace Lamp” message appears on screen. Don’t wait. Buy an authentic lamp from a recognized, authorized dealer and replace the lamp immediately! The actual projector lamp bulb can shatter if there are any fingerprints or greasy marks left on the glass. The oil from your fingers heats up when the lamps start working, causing a hot spot that may result in the lamp overheating and exploding. Clean the bulb with a lint free cloth and some isopropyl alcohol. Try using rubber gloves when changing the lamp to prevent fingerprints or marks on the bulb. Each projector model has a specific routine for installing the replacement projector lamp. Some models require the air filter to be changed at the same time and failure to do will result in the new projector lamp not working. Other models need specific connectors to be re-attached. Sometimes if the connecting screws are not tight enough or too tight, this can result in the projector lamp exploding. Follow all the instructions for your particular model. Read more about what to do when your projector lamp explodes.